John Moore is an engineer who lives and works in Houston, Texas. He writes science fiction and humorous fantasy. 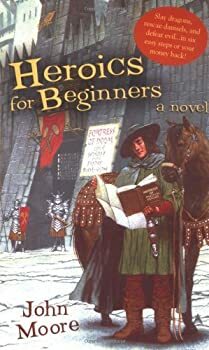 Heroics for Beginners: Very funny! Slay and Rescue — (1993) Publisher: It’s not easy being a prince and Charming had just about enough of it: dragons to slay, villains to fight, and one beautiful princess after another demanding to be rescued from a fate worse than death. But in the Slay and Rescue business, you’re always on call. The Unhandsome Prince — (2005) Publisher: “There’s magic in a kiss,” the young sorceress Emily tells Caroline. But the beautiful Caroline knows that already, for kissing an enchanted frog has earned her the right to marry a handsome Prince. There is one catch — Prince Hal is far from good-looking. So both girls set off for the city of Melinower, where princes abound, hoping to trade Hal up for a handsomer model. But the pair soon learn that it’s easier to find your prince than to marry him, and before long they’re tangled in a plot involving a mysterious dwarf, a magic sword, a kidnapped bride, a Dark Tower — and the unhandsome Hal has plans of his own for our two heroines. Bad Prince Charlie — (2006) Publisher: Damask: A kingdom that couldn’t get ransacked if it tried. But that’s exactly what its rulers have in mind. And when they need a puppet to put on the throne, Bad Prince Charlie seems perfect for the job. But Charlie has second thoughts when he’s forced to imprison the beauteous Lady Catherine. Ransacking Damask, it turns out, is only a cover for the real plot. And it’s up to Charlie to rescue Catherine from prison, the country from destruction, and his own neck from the noose! A Fate Worse Than Dragons — (2007) Publisher: In the Kingdom of Medulla, there are only two ways for a brave knight to marry a beautiful princess. One is to be born rich. The other is to rescue her from a fate worse than death. Terry chose the second method. But he didn’t count on Princess Gloria having her own ideas on the subject. And when her plans go awry, the two must team together to rescue not only themselves, but every girl in the kingdom from the talons of evil. And stale toast.